Black Literary Agents – Find all African American book agents appearing on our List of Literary Agents using the official Directory of Literary Agents™. Scroll below to learn more about black book agents such as Faith Hampton Childs with Faith Childs Literary Agency, Regina Brooks with Serendipity Literary Agency, Martha Millard with Sterling Lord Literistic, and Susan Ginsburg with Writers House. And, here are two more articles that you might find valuable: Are Literary Agents and Publishers Prejudiced? and Literary Agents Seeking Diversity. Susan Ginsburg is one of the better known black literary agents with Writers House Literary Agency. Susan has worked in the publishing industry for more than thirty years, starting on the editorial side as Editor-in-Chief of St. Martin’s Press and Atheneum Books. She also served as Executive Editor of Simon & Schuster’s Pocket Books. Susan is interested in some nonfiction, as well as both commercial and literary fiction. She’s published acclaimed authors such as Alice Walker who wrote The Color Purple and John Irving who wrote The World According to Garp. The largest African American-owned literary agency is Serendipity Literary Agency, LLC, in New York. The agency was founded by Regina Brooks and her agency seeks to acquire titles from people of color, including black authors, around the world. They have many black literary agents and represent a wide range of award-winning authors of fiction, nonfiction, and children’s books. Prior to becoming an agent, Regina held senior editorial positions at John Wiley and Sons and McGraw-Hill. She was the first African-American editor in their college division. Writer’s Digest magazine named Serendipity one of the top 25 literary agencies. 22 black literary agents work at 16 of the 6oo+ different literary agencies in the United States; however, 261 agents accept queries for multicultural fiction and 233 agents accept queries for nonfiction books dealing with multicultural issues. 13 of the 16 literary agencies with black literary agents have websites. 15 of the 22 African American literary agents are in New York. 4 of the 22 African American literary agents are AAR Members. The largest literary agencies with one or more black literary agents are Writers House, Sterling Lord Literistic, Inc., Fuse Literary, L. Perkins Agency, Red Sofa Literary, and Serendipity Literary Agency. The largest literary agency owned by a black literary agent and the agency with the most black literary agents is Serendipity Literary Agency. 13 of the 22 agents accept email queries. 7 of the 22 agents accept postal mail queries. 9 of the 22 agents accept queries via online forms on their websites. 15 of the 22 agents are on Twitter. 7 of the 22 agents are on Facebook. 16 of the 22 agents are on LinkedIn. 21 of the 22 agents accept queries for fiction. 19 of the 22 accept queries for nonfiction books. 18 of the 22 agents accept queries for children’s books. Before you query African American Literary Agents, make sure you have the most up-to-date information by looking in our Directory of Literary Agents™. There is no charge to use the directory. It’s easy to use. And it contains detailed biographical and contact information for all black literary agents. When you enter the Directory of Literary Agents™, you’ll also get free, instant access to our article and audio library with additional information to help you get an African American literary agent. The Directory of Literary Agents™ has been called the most comprehensive and accurate list of literary agencies and black literary agents available today, in print or online. Other literary agent lists and directories are often incomplete, outdated, and filled with mistakes. The Directory of Literary Agents™ is completely up-to-date with full profiles and photographs for every African American book agent in the United States. There are more than 1,000 literary agent listings in the directory and you can search by location, book genres, AAR status, and more. 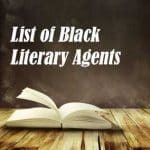 Scroll below to see a sample listing for black literary agent Regina Brooks and then enter the directory to see detailed literary agent listings for all African American literary agents. When you enter the Directory of Literary Agents™, you’ll be able to see complete profiles for all African American book agents, and all other book agents. Before you submit a query letter to a black literary agent, make sure the information you’re using is correct. Most literary agency directories and lists, in print and online, aren’t maintained properly. They’re incomplete, outdated, and include lots of mistakes. If you rely on those literary agency lists or directories to find African American literary agents or any other literary agents, you’re going to hurt your chances of getting a book agent. Get free access now to the Directory of Literary Agents™ for the most up-to-date information and listings for all black literary agents.